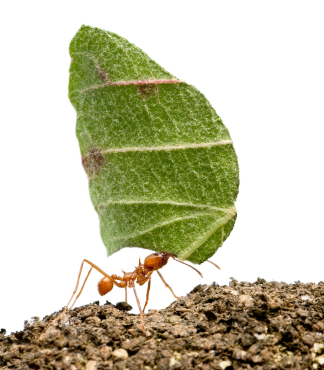 Texas Leafcutter ants harvest the leaves of plants. 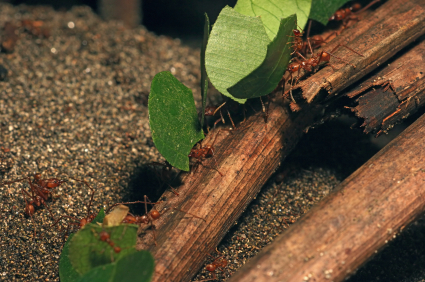 They cut circular-shaped pieces from leaves, and carry them back to the colony, to use as fertilizer to encourage the growth of a specialized fungus; that serves as the ant colony’s food source. Remarkably, the Texas Leafcutter ant can detect chemical signals from the fungus, that warn if a particular type of leaf is toxic to the fungus. Once positively identified, these ants will no longer collect it. The Texas leafcutter ant is found in south-central Texas from San Antonio to Dallas. It may occasionally be found east-ward, extending into Louisiana. Nests are constructed in the soil and may cover covering hundreds to thousands of square feet in size, number more than one million ants and extend more than 15 feet underground; if located in an undisturbed field or wooded area. In some instances, Texas leafcutter ant colonies can become a nuisance and serious insect control problem, if they begin to attack crops and farmland, or damage roadways; with nest-building activities. Not to be underestimated, some species are capable of defoliating an entire citrus tree, in less than 24 hours. A small tree or large shrub, can have all its leaves stripped, in a single night.